Some streets just do not feel safe to walk along. Perhaps it is the lack of space between the cars driving by or even the lack of a sidewalk in some instances. It’s even more precarious for bicyclists who sometimes have the benefit of designated bicycle lanes but most of the times compete with cars to share space on the roads. It was not always like this. When the automobiles first came around at the dawn of the twentieth century, they had to compete with a lively street scene that included horse drawn buggies, pedestrians and bicyclists. Tensions came to a boiling point in Cincinnati and in 1923 when citizens attempted to pass a ballot initiative limiting the speed of automobiles to 25 miles per hour. The auto industry banded together to defeat the proposition and our streets were never quite the same. 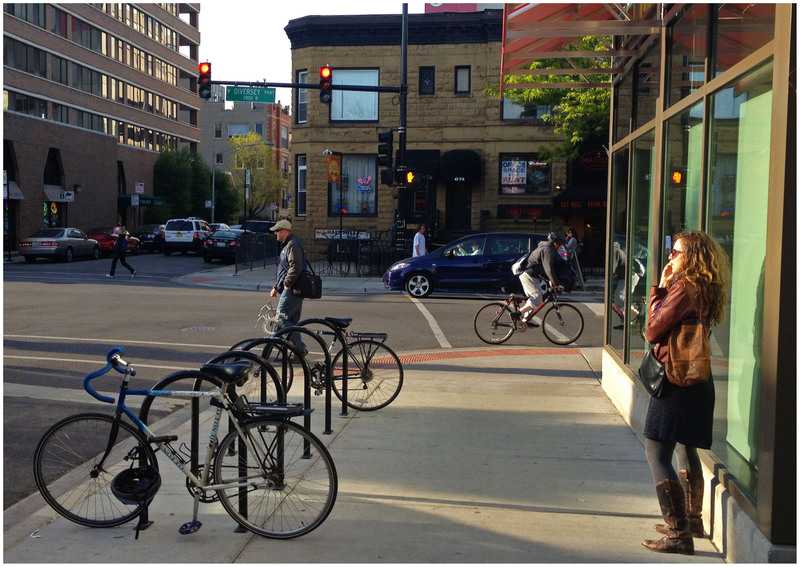 Pedestrians, bicyclists and automobile drivers peacefully coexist on Diversey Street on Chicago’s north side. Photograph by Randy A. Simes for UrbanCincy. Fast forward to today where Cincinnati City Council’s Livable Communities Committee will listen to an update on the city’s on-going Complete Streets initiative. The movement, which got its start through a motion sponsored by Vice Mayor Roxanne Qualls (C) in August 2009, is now an integral part of the on-going, five-day charrette for the city’s Plan Build Live initiative. Complete Streets are regulations that allow streets to be redesigned to focus on shared use with bicycles and mass transit as well as better conditions for pedestrians. The problem in Cincinnati, and throughout much of the United States, is that people drive past what used to be viable places. The initiative, in theory, would improve conditions for many of the city’s struggling neighborhoods by reorienting them towards the users for which they were originally designed. “We need to ensure that our neighborhood business districts are destinations and not just raceways through town for commuters,” Vice Mayor Qualls explained in a recent press release. The standards aim to improve walkability and slow traffic in business districts. This can be done by adding on-street parking, converting one-way roads to two-way traffic, and providing connections through smaller block sizes. Some of the focus areas mentioned by consultants Hall Planning & Engineering included the conversion of McMillan Street and William Howard Taft Road into two-way streets and making improvements to the Reading Road corridor. The standards, officials say, are part of the city’s form-based code efforts and planned to be finalized by this summer. Anyone is welcome to attend the meeting today which will be held at 11am inside City Hall (map).